Tomorrow, February 2, is the feast of the Encounter of Our Lord and Savior Jesus Christ. 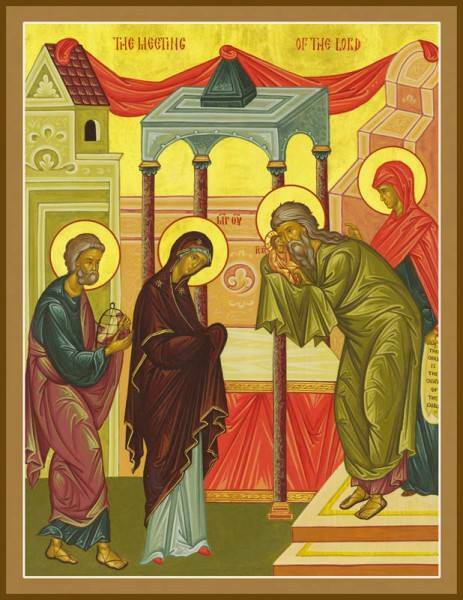 The Divine Liturgy with the Blessing of Candles will be offered at 9:00 a.m. in both English and Ukrainian. This day is a holy day of Love. The intention for the Liturgy will be for Vira Walnycky –40 days. 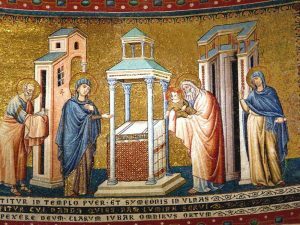 The Byzantine Church views the feast Christologically and calls it The Meeting of Our Lord, commemorating the first time Jesus meets His people publicly in the Temple. The Spirit comes upon the apostles in the form of tongues of fire. God is the light of knowledge and understanding and the fire of love. How can we dare to touch him and live? Simeon holds him and cries out, “Now you may dismiss your servant!” Yet we do, and Holy Communion is called the “coal” in some Eastern Christian traditions, the ember that purified the lips of Isaiah. God cleanses us from our sins and makes us worthy to receive him more intimately than Simeon, in our lips and in our body. We receive Communion “for the forgiveness of sins and life everlasting.” As we celebrate this feast, we can never comprehend this gift.